Up to now you were able to see how many times your ads are shown in other apps and how many clicks they get. Monitoring your click-through rate can give you a good idea of which ad copy attracts user attention better and optimize your ads and campaigns. But whatever happened after the click was a mystery. You had to rely on trying to deduct the effectiveness of your ads from the changes in your download numbers and, unless you were dedicating substantial budgets, it was really difficult to distinguish between the effect of your ads and organic fluctuations. Today I’m happy to announce the immediate availability of our conversion tracking feature. As you can see from the screenshot the feature is still in beta and is only available for Windows Phone apps and campaigns running AdDuplex SDK v.2 or higher. Since the Windows Phone platform doesn’t provide reliable means to track users across apps, we had to implement our own “fingerprinting” technology to match those clicks to installs they generated using a set of secondary environment factors. For this reason the system cannot be 100% accurate. Through our internal testing over the last couple of months we observed 85-90% accuracy. Finding the balance between false positives (attributing installs to wrong clicks) and false negatives (not attributing installs to clicks that generated them for some reason) was tough and we decided that we would rather underreport the installs than attribute conversions that didn’t happen. So when you look at the conversion stats it is safe to assume that the actual number is about 10% higher. What information can I get from these stats? For apps you can see the number of conversions and click-to-install ratio (so called install rate or IR). For campaigns you get the number of conversions and IR, plus you get the same for each individual ad – so you can choose a perfect ad copy easier. We will also show you your cost-per-install so you can evaluate the effectiveness of your whole user acquisition strategy. OK, what do I need to do to start seeing these stats? Well, if you are doing cross-promotion using our SDK v.2 or higher AND you are promoting the same app as the one showing the ads AND you are using AdDuplex exclusively AND you are showing AdDuplex ads on the first/main page of your app, then you are all set and you don’t have to do anything else. If you are doing cross-promotion targeting another app you have to make sure that the target app either uses AdDuplex exclusively and shows AdDuplex ad on the first page of the app, or you have to implement our tracking code into the target app (see below for the details). The actual namespace varies a little depending on the development platform. Please see our Getting started guides for each specific platform for details. We will continue improving the algorithm to get you more accurate results. We will also bring conversion tracking to the Windows side of AdDuplex. I hope that you find this feature useful and we would love to hear your thoughts on this feature in the comments below or via email at info@adduplex.com. I like it. One question Alan. Will this tracker initialization cause a delay for application launch? 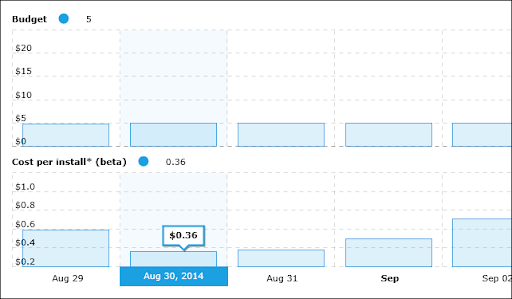 I’m currently fighting some Google Analytics and In App Purchase related delays, so I’m wondering how about yours?